For those who works standard day jobs, have you considered taking your bicycle out for a ride at Taipei’s riverbanks after nightfall? The beautiful riverside scene will help you wash away the fatigue accumulated from a busy day at work. The most important part of nighttime cycling is safety. The Hydraulic Engineering Office reminds cyclists to embark on the ride with a companion, as well as ensuring the basic riding gears are in place. It also offers a list of suggested trails. 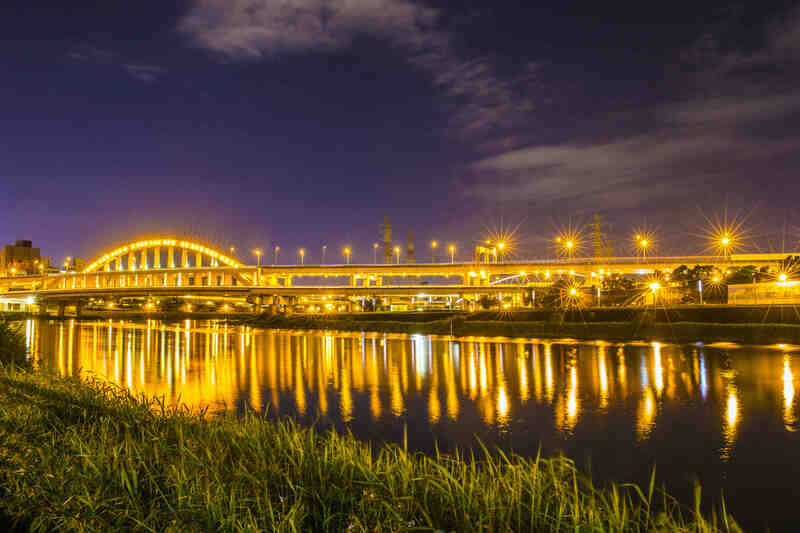 For those enjoy the nighttime landscape, the Keelung River bike trail will take you through Dajia, Yingfeng, Meiti, Rainbow, and Chengmei riverside parks. The advantage of taking this route is the presence of many bridges along the way, including Dazhi Bridge, First MacArthur Bridge, Second MacArthur Bridge, and Rainbow Bridge. Without stopping, it takes roughly 30 minutes to make a round trip from Chengmei Bridge to Dazhi Bridge. For those seeking a balance between exercise and snacks, why not take the route passing by Dadaocheng wharf, Guting riverbank, and Rainbow Bridge? The plaza at Dadaocheng wharf boasts a dining area featuring exotic cuisine, with Yongle Night Market located within walking distance from the evacuation gate. The Gongguan commercial district is only 10 minutes on bicycle from the riverside park exit. Of course, don’t forget to visit Raohe Street Night Market, which is a mere five-minute walk from the Rainbow Bridge. For those who simply want to enjoy the great outdoors, they can either start their rides at Guandu wharf or Dadaocheng wharf – two great places to watch the sunset and the waning lights from the riverbank. The riverside next to Shezidao also boasts one of the liveliest ecosystems along the Tamsui River. The riverside bicycle trail of Taipei City spans 112 kilometers, connecting 28 riverside parks. Since 2013, HEO has worked with private sector associations such as the Taiwan Bike Association to implement policies such as trail expansion, division of pedestrian traffic and bicycle traffic, increase the number of signs and warnings, and strengthening nighttime lighting along the trails.